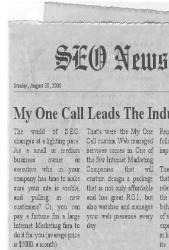 Should SEO Firms Use Other Search Engine Optimization Companies? We have had the opportunity to work with several other SEO firms over the last year. In each case we were brought in by a client to advance the local rankings and visibility, and the client was using another SEO firm over a period of time. In most cases the other SEO had done a decent job of improving organic rankings, and many were on the first page, but the program seemed to have hit a plateau. We recommended the client stay with the current SEO program, and we added our own services. Working with another SEO can be a bit of a challenge, but because our tactics and strategies are pretty unique, we didn’t bump into each other very often and in each case the results were excellent. Let’s face it, if you are a white hat professional SEO you shouldn’t worry much about working side by side with another competitor. We all have our unique processes. I see many SEO’s who focus on content, and we love that strategy! Some focus on Social Media, and that’s a great tactic when done correctly. Some focus on on-site, which is absolutely essential, and some focus on directories, blog comments and other old fashion SEO. Each has their unique understanding of what works, and how to accomplish it. We use a combination of all of the above, with a careful research into any tactic we use to increase a clients on-line visibility. So if you are an SEO firm, or a business looking at SEO, don’t be timid in teaming up. It may be one of the best strategies to get results quickly. Hey… there are like 10,000 SEO firms out there, and I would say 500 are really good, and 250 are great. If you were a football coach and the rules allowed you to play as many good players as you could fit on the field and the other team only used the standard 11… you are going to win. So consider teaming up. For SEO firms we have a very good supplement program for your local clients, and for businesses looking at SEO. We can recommend a second SEO to work with us or directly for you. I’m not joking. This works really well if managed correctly. Give me a call if you want to discuss this system.